"My mental hands were empty, and I felt I must do something as a counter-irritant or antibody to my hysterical alarm at getting married at the age of 43." 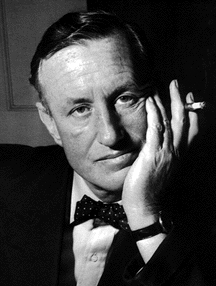 In case you've been under deep cover for the last 50 years, Ian Fleming is the famous author and creator of the character James Bond super spy. I am assuming the above quote is Fleming's answer to the question, "Why did you start writing novels?" because he was unhappy in his marriage, and he wrote his first book Casino Royale right after his union to Anne Charteris in 1952. I have a theory that James Bond is patterned after Fleming himself. Firstly, Bond is characterized as a womanizer. Fleming finally married Anne after years of having an affair with her, while she was married. He was forced into the marriage after he impregnated her, however, it is obvious from his quote that he resented it. Secondly, his womanizing went along with his love of fine food and beverage. He loved Jamaica, which he considered paradise, and it was on this subtropical island that he traveled, chased women, and ate and drank his fill. He built a home there which he called Goldeneye. Also, during World War II, Fleming worked for British Intelligence. He was the assistant to the Director of Naval Intelligence for a while, and eventually headed 30 Assault Unit, a unit of commandos that executed specialized spy missions. As the pundits have always instructed authors, "Write what you know." Just an aside: when he met Sean Connery, the actor who played James Bond in several of the movies, Fleming said, "I'm looking for Commander James Bond, not an overgrown stunt man." I guess he wasn't pleased. If he had lived to today, May 28, 2011, he would be 103. Here is a video piece on his Jamaican estate, Goldeneye. It's narrated by Chris Blackwell, who has bought and expanded the estate. REALLY COOL! Such an interesting backgroung ... like the most interesting man in the world ad ... on such an icon.